Under the weather and in bad weather, Noah Syndergaard tossed six shutout innings against the Braves on Tuesday, but the bullpen blew it in the Mets’ 7-3 loss. 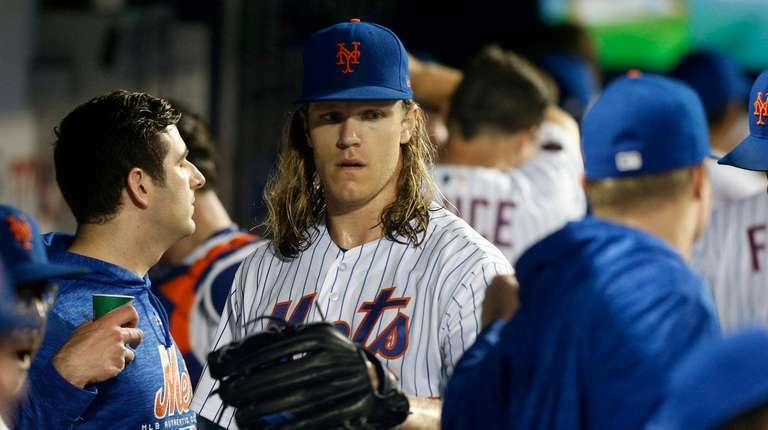 Syndergaard was so sick, manager Mickey Callaway said, that the righthander wasn’t sure he was going to be able to make his start as scheduled. A 24-pitch first inning — in the rain, which fell for most of the game — didn’t quite quell those concerns. Syndergaard did the Mets one better — he put them in a position to win. Reeling in his pitch count after the long first, Syndergaard needed only 47 pitches for his final four innings. He scattered three hits and two walks and struck out five. It was Syndergaard’s second scoreless outing of the season (and second in his past three starts). Robert Gsellman (four runs, three earned) and Jerry Blevins (three runs, two earned) recorded one out each as the Mets’ relief corps again proved unable to hold a lead. Gsellman has allowed eight runs in 8 1/3 innings this month, a slump he blamed on his sinker moving laterally as opposed to downward — the product of a mechanical flaw, he said. Callaway said the Mets haven’t discussed shutting down Gsellman, who in his first full season in the bullpen leads NL relievers with 79 1/3 innings. Is Gsellman fatigued? Callaway said there isn’t any evidence that’s the case.